Seattle Youth Hockey Assist began as a golf tournament Ryno set up to help out a hockey family, dubbed the Jake Murphy Memorial Golf Tournament, in honor Coach Murphy’s son who had recently passed away. Tyler and Morgan had twin sons, Brody and Hunter, who were born 3 months premature. They both required intensive medical care, especially Brody, which came with the accompanying medical bills. Many people wanted to help, so Danica and Ryno figured a GoFundMe campaign and a golf tournament were great ways to bring everyone together for a fun time while raising some money. Partnering with the Seattle Totems nonprofit junior hockey team, the tournament and GoFundMe campaign raised over $4,000 each to help out the new family. The next year, Ryno decided to hold the tournament again, newly named the Jake Murphy Charity Classic. Wanting to help youth hockey in the area, Ryno decided the proceeds would go towards helping youth and junior hockey players pay for their hockey through scholarships. Through word of mouth the tournament doubled in size from the previous year bringing in more than $10,000 to help keep kids on the ice. After seeing the success his golf tournament was having, Ryno decided it was time to create his own nonprofit to be able to better assist youth hockey throughout the Great Seattle Area by incorporating Seattle Youth Hockey Assist through Washington State on February 23rd, 2018. 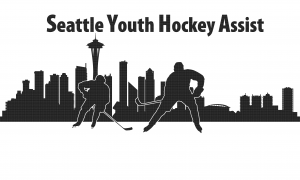 With the help of a fellow hockey buddy, Mike Ringstad, who is also passionate about giving back to the game they grew up playing, Seattle Youth Hockey Assist is working to provide hockey scholarships to families in need, as well as help improve and grow hockey in the greater Seattle Area. In 2019, the Jake Murphy Charity Classic has been renamed the SYHA Training Camp Classic presented by Moonshine BBQ. Tickets and Sponsorships are available, sign up now! Growing up in Bothell, Ryno played his minor hockey at Sno-King (SKHA). At 15 he began his juniors with the Seattle Totems before moving to Spokane to play for the Spokane Braves. After a few seasons in Spokane and some stints in various other junior programs, he came back to finish juniors where it started, with the Totems. Ryno played 4 years at MSOE while earning the All-Freshman Team award and multiple All-Academic Team awards in the MCHA conference of NCAA Div III Hockey. Following graduation Ryno received an offer from Boeing and also spent the next 3 years coaching Peewee AAA and Bantam AAA before going back to school to get his Masters. Ryno knew he wanted to begin to pay it forward for all the help he received over his playing time…especially the financial assistance. This was when the first year of the golf tournament began…after the initial success, all he wanted to do was find a way to make it bigger, better, and capable of helping more kids. Mike grew up in Snohomish and played his youth hockey at Seattle Junior Hockey Association (SJHA). He played at SJHA until he left for juniors in Montana at the beginning of his senior year of high school. Following juniors, Mike played for the Washington State University club hockey program for 4 years. After graduating college, Mike began coaching the SJHA Bantam AA team for 4 years. Having been around hockey his entire life, he knows how expensive hockey can be and also knows all of the benefits it brings. Mike is excited to be able to give back to the game that has given him so much.